The sights and sounds of Austria's timber industry were constant companions as we began our generally eastwards journey from Austria's border with Italy and towards Slovenia. The deep valley walls were heavily forested and the logs whizzing by on trains and trucks indicated that at least some of those forests were actively managed resources. Large and small wood shops cranking out furniture and decorative items were common sights on the edges of villages and towns. And as we were making a tight downhill turn on a bike path, Bill drew my attention to the rhythmic pounding we had heard in Germany's Black Forest historical exhibits--that of a water powered saw mill. As we wound our way out of the mountains, Austria's timber industry was consistently the most visible part of the economy. People aren't the only ones who stare at us. As we dropped to the lower elevations along the Drau River valley, the corn towering over us said that trees and the ever-present hay growing weren't the only shows in town. It wasn't long until the coasting out of the mountains changed to that of flatter valley riding. Gone were the logs and we no longer spotted freight trains loaded with truck-trailer rigs heading over the next pass. Austria has an extensive network of heavily used bike routes, both in the mountains and in the river valleys. Unfortunately, their designers are quite satisfied with rough gravel surfaces and too readily accept 15% grades in hilly stretches, so the going can be slow and bouncy. But the routes are usually scenic and out of traffic and we always enjoy the sense of community that comes with being among other cyclists. And even though the paths weren't quite idyllic, they weren't the brutal combinations of gravel and grade we had farther west in Austria on the Via Claudia Augusta route. For the first couple days in Austria, we still spotted signs of Italy, a culture that we were sorry to leave behind. There was the occasional bilingual tourist sign that gave us our last "road scholar" language lessons and still a bit of the nice quality Italian produce in the markets. We go through withdrawals when we exit Italy but departing via the mountains delivers a less-abrupt transition because of more cultural overlap between the border regions than in most other parts of Europe. 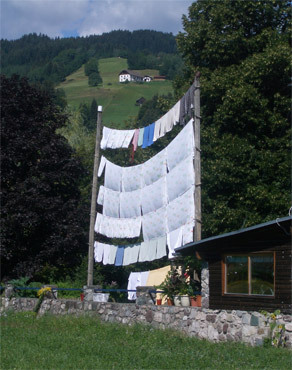 The tallest clothes line we'd ever seen was in Austria. The architecture changed with the geography and industries as we moved out of the Alps into the river valleys. In the Alps and Dolomites, the stained wood exteriors of the mountain chalet-look had been a seemingly mandatory standard with inviting balconies fronted with robust boxed flowers. As we descended, we started coming upon old estates with decorative pink or yellow stucco facades, often with white trim. Definitely a "Neo-something" style of architecture that we dubbed "Late Empire" as we imagined it was all the rage at the end of the Austro-Hungarian Empire at the turn of the 20th century. Unlike the chalet-look, the "Late-Empire" was a style that carried into the towns and cities that has become oddly juxtaposed with the aggressively contemporary designs. Some homes and small businesses cry out to be on the cover of design magazines with their clean lines and gray tones blended with the heavy use of exposed concrete, steel cables, and glass panels. And of course, there were all the other less distinct designs filling in between these eras. Every country or region has it's mish-mash of architecture but Austria's spans a much bigger array than what we'd see back home. We followed the Drau River for several days, from near the border with Italy to the small city of Villach. A familiar cross-roads city for us, Villach became a layover point this time through the area. It was from Villach that Bill made the 12+ hour journey into Vienna and then out to a suburb and back again to pick-up the laptop battery we ordered. We paid a premium to buy the battery in Europe and over $100 in train tickets and darn-it-anyway, it didn't solve the problem. What a heartbreaker after weeks of negotiating and anticipation and one very long travel day. Buying a new battery was one of those diagnostic steps that's easy for the technician to suggest and not so easy on the customer. "Try a new battery and if that doesn't fix the problem, then it's the mother board." What were we to do but try a new battery? We knew it was a gamble and in general, our luck is good, so we'd expected the best. Fortunately, our laptop was still usable, but if the problem was with the mother board, we wondered for how much longer. The battery wouldn't charge but we could use the laptop if it was plugged into the wall electricity. It sounded ordinary enough, but we knew from experience that we benefited tremendously from a functioning battery. The battery allowed us to use the laptop on the rare occasions when we flew or traveled for hours by bus, train or ferry. Then there was the matter of the thunderstorms when we methodically unplugged the device and AC adaptor to prevent damage to either from a power surge. The 'computing time' lost in the evenings some weeks due to storms amounted to double-digit hours. Switching the computer to another electric outlet when some other need arose in the evening meant powering all the way down and rebooting, an annoying interruption when available working time was short. And the lack of battery power severely curtailed using public WiFi out on the streets or from balconies. None of this was a crisis, but we were very clear that literally being on a 'short leash' with a chronically-ill computer for more than half of our touring season would be an unwelcome inconvenience. Oh well...... We reminded ourselves that we were indulging in a fabulous lifestyle and in the bigger picture, this was really a minor blip. It was from Villach that we did a rare, week-long out-and-back loop for some eastern Austrian Alps hiking, close to the Italian border. Bill has tried hard to let the Austrian Alps dazzle us like the Italian Dolomites do, but it hasn't been easy. Like last year, this year we again ended the ride up to the first of our two Austrian hiking venues by pushing our bikes. Last year it was 23% grades on a main road that had us pushing 2 to a bike; this year it was the last 1/2 mile on a gravel road to a mountain lodge. It was a lovely surface as gravel goes and the grades were probably just under 20%, but it still was exhausting..
We seem to be just enough stronger now that if we can't pedal up the grade, we can't push up either. I tried pushing my bike alone and couldn't imagine how I'd ever make it to the end of the road without unloading. Bill bailed out on pedaling a little after me and kindly came back to assist. Even with 2 pushing 1 bike, we had to stop often to catch our breath and rally our will. It was the poor public transportation that made getting poised for our first Austrian hiking venue of the year such an ordeal. The buses that ran by the Plöckenpass trailheads from the nearest village only operated 3 times a week and the infrequent service on those 3 days left one with just under a 6 hour hiking window--less time than the celebrated routes required. Since the bus wasn't an option, we biked to the lone lodging establishment near the trailhead, but it was a 45 minute walk 1 way to the real trails. We quickly appreciated just how spoiled we'd been in the Dolomites with our choice of trails out our door, a network of interlinked cable cars, and daily bus service around the primer passes. Is one really lost when among so many? Out on these acclaimed Plöckenpass trails, it was clear that the panoramas weren't as grand as the Dolomites--the difference between looking at 1 peak versus being surrounded by dozens of peaks and high plateaus. For me, the proverbial Acid Test had morphed into the Rain Test: "If it rains, am I still eager to go out and hike?" Looking at the bottom half of cloud covered Dolomites was still delightful, still fascinating, even in the rain. Looking at the bottom half of these mountains limited one to looking at tree farms. The difference in the views at the 2 venues was enough to decide whether to make a rainy day an indoor-day or not, but the trail surface differences were even more polarizing. In the Dolomites when we were lodged at the 4,000-5,000' level, there were many nearby trails with rocky surfaces that were mud-free and easy to walk on even in the rain. In the areas of Austria where we hiked this year and last, the trails at that elevation and even significantly higher were a mix of soil and rock, often leaving us to scramble up steep, mud-slickened slopes even the day after a rainy spell. The security of the footing was quite compromised in the mud and we'd always rather avoid mud than slog through it and have to do all the clean-up later. And we learned the hard way that the Austrian maps weren't as good nor were the trails as well marked as in the Dolomites. That led to a lot of frustration, backtracking, and one evening even had us fretting about getting back to the lodge before dark. 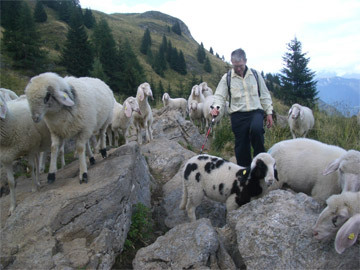 Bill's latest efforts at broadening our hiking horizons highlighted that the Dolomites have 2 special aspects. The first edge the Dolomites have over most areas is the exceptional visual quality, including the outstanding panoramas in the area. And the second factor is the infrastructure in the Dolomites: the extensive network of buses and ski lifts that allow car-less hikers to plant themselves in 1 location and have access to multiple, high quality hiking areas. In contrast, Austria is generally more of a "park 'n hike" culture requiring a car to get to hiking areas and then only delivering access to a single collection of trails. Even when Bill scouted out ski lifts in Austria to launch our hikes, it was still just 1 lift, giving access to a single area. He hasn't given up however, and is still on the look-out for better hiking areas in Austria. Fortunately, the 2 hiking venues Bill selected for our week-long loop out of Villach each had a pay-off besides the hiking itself. The first venue was an outdoor war museum, the second included a more challenging Via Ferrata route. Everything in this frequently contested border region had 2 names, German and Italian, even today. But rather than being in the spirit of continuing the battle, it supported the agenda of promoting peace and putting the past to rest. In addition to the names, the signs and brochures were all bilingual. 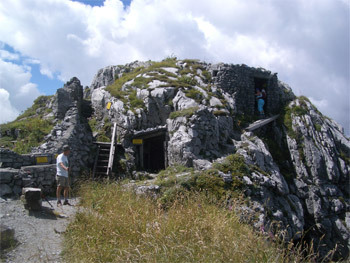 Remains of a stone fortress on the Austrian side. 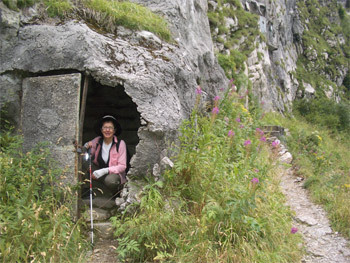 An artificial cave entrance concealed stairs to Italian high tunnels. The peaks above Plöckenpass had been the site of WWI's mountain equivalent of the notorious trench warfare--warfare that went nowhere for years. Rather than mired in the mud of France, these trenches of piled stone looked like Roman ruins. And like in western Europe, the front line trenches were practically eyeball to eyeball. It was astounding to stand on the remains of the Italian rock fortress and realize the Austrian barriers were literally just a stone's throw away. We had to walk the short distance several times to internalize how close they were to each other. We spent 2 hiking days trudging up the steep mountain sides to these battle front peaks and wandering through the rocky ruins of the outdoor war museum. The steepness of the approaches that we and the troops traversed was underscored by how often we were practically on all 4's, as our hands often rested on rocks that would support our next foot step. The remnants of kitchens, barracks, command posts, trenches, and tunnels covered the hill top and expanses of the mountain sides. Some structures were constructed by chipping hollows into the native rock, others were created by stacking stones. The Austrian side included a reconstruction of the tiny aerial tram they used to haul supplies close to the top and the small rail line at the bottom to feed it. When we descended to the Pass on the Italian side at the end of the second day, we were dumbfounded to discover an incredibly well camouflaged entrance to a tunnel complex. The Italians had crafted an artificial cave out of mesh and concrete that completely concealed a concrete staircase used to access a series of tunnels in the mountain side. It was so well done that we'd walked alongside 30' or more of it without even noticing it wasn't native rock. It was only in investigating the entrance that we understood it for what it was. The second stopover Bill planned for us on our Villach to Villach loop was a long hike with a Via Ferrata route. 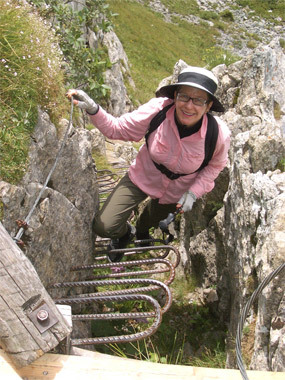 Of course, we were in Austria now and Via Ferrata is "Iron Way" in Italian (referring to the steel safety cable) and in German it is instead the less romantic "Klettersteig" or "Climb Up". This wasn't the outdoor peace museum and so instead of collaboration, there was a tug-of-war with the languages on the hiking route which zigzagged across the current Austrian-Italian border. Neither the Austrian or Italian maps or signs referenced the other, so the blended route we did had to be referred to as the "Klettersteig on Crete Rossa." That informal name was a mix of German and Italian: the German Klettersteig reflected the Austrian claim to the general route which included the steel cables; the Italian peak name referenced the culmination of the hike which was in Italy. And yes, this bit of turfing did make the route challenging to follow: the route markers painted on the rocks and the posted signs were those of the country you were in at the moment so the names and symbols were constantly changing. Finding the trail wasn't always easy--especially in the boulders.. Welcome sign posts at the summit pointed the way down. Bill had consulted with a young man at a mountain bike rental shop who luckily was also familiar with the climbing routes and indeed the route was comfortably within our ability range. Like the Via Ferrata routes in Italy which we accessed by a series of cable cars, we had to hustle on this route to get off the mountain before our transportation link closed for the night. We enjoyed the challenges of outing and it met Bill's primary goal which was to check out the viability of doing Via Ferrata routes in Austria. The bad news about this recon trip was to learn that it is very difficult to get information about the Klettersteig hiking routes in Austria (and also later in Slovenia). In the Dolomites, Via Ferrata books are available in many languages and are easily picked up in bookstores. In addition, you can chat with folks at the mountain shops or guide offices for further information. 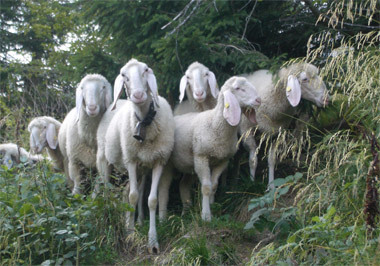 Bill asked a string of people about routes near our 2 hiking venues in Austria and got little help until the bike shop man. In addition, the quality of the maps was poor and there were no books available. "Plan B" is to check the internet for next year but it was disappointing to discover the paucity of resources for the hiking visitor. We headed back to Villach happy to have done more hiking but disappointed that we were still searching for a hiking region in Austria that would be worth a second visit. 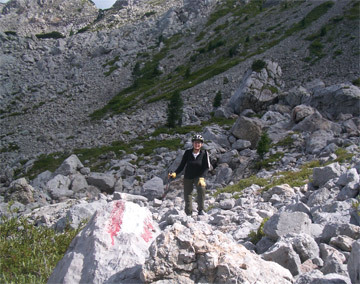 Once back in Villach, we mailed our hiking and Via Ferrata equipment home for the year. We'd do a little more hiking in the Slovenian Alps but were content to do it in our Chaco sandals and with the help of our too-awkward to mail trekking poles. 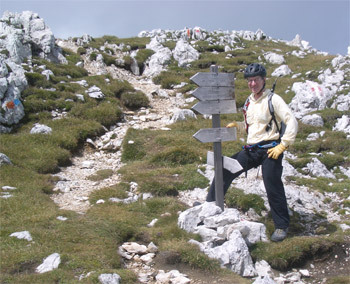 And, as near as Bill could determine, there were no Via Ferrata routes in the Slovenia. 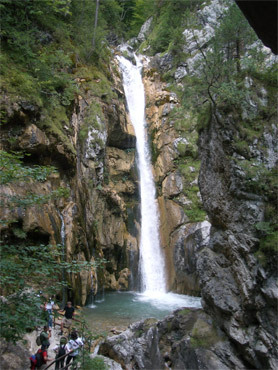 The largest waterfall on the Austrian gorge walk. In an odd little kink in our itinerary, we did the scenic gorge walk at Tscheppaschlucht, Austria up the hill from the border town of Ferlach after biking into Slovenia. We'd noticed the steady stream of cars turning into the parking lot early in the brutal climb up Loiblpass Pass. A little farther up the road we stopped to catch our breath and read an info board about the area. The gorge walk had 3 main routes and looked like it would be a nice outing but we couldn't imagine how to include it in our itinerary that day or in the future. Doing a hike from the road of a steep pass just isn't a workable situation for us on bikes. But after being in Slovenia a day I discovered that I must have left one of my super-wicking, quick-drying T shirts back in Austria, in Ferlach. It was an old shirt but the bright pink color was a mood lifter and I hated to lose it. It didn't take long to determine that there were no buses or trains going over the pass and the international border and language barriers made it hard to imagine having it mailed. I'd made peace with abandoning it but then tumbled to the idea of renting a car to both fetch it and to do the awkwardly situated gorge walk. By racking my brain I remembered enough of the name of the Ferlach pension to recognize it on the internet where we also located its phone number. Bill called the German speaking host and determined that "Rosa Bluse" was indeed there. The rescue mission was on: we drove over the pass, picked up Rosa, had a fine time doing the gorge hike, and visited up an obscure, out-of-the way nail forge museum in Kropa. 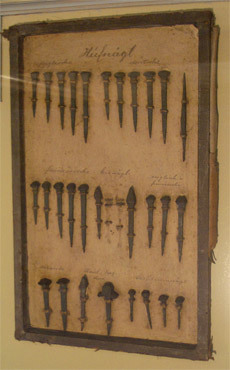 One of many cases of hand-forged nails. Our little 1-day junket would have been too expensive were it only to retrieve $24 Rosa Bluse, but was a delightful, multi-function day. Our guide book raved about the nail forge museum which we found to be lacking but we were sure glad not to have taken the time and trouble to bike there. And seeing the sometimes challenging Slovenian roads from a motorist's perspective added an interesting dimension to our stay in the country. Plus, we always enjoy the rare opportunity to scrutinize a difficult pass by 4-wheels after we've done it on 2 as the vivid memories and visceral sensations of the struggles and triumphs coming streaming back. The whole event underscored that we should be more open to renting a car for a day or 2 to solve seemingly impossible sightseeing problems. Mind Games on the Road #3: Creativity or Madness? I often think that traveling has given me insight into the frame of mind required for writing children's books, but then I wonder if instead it's given me a window on my own madness. As we've traveled, we've inadvertently accumulated a menagerie of companions, as one presumably intentionally creates when writing a children's book. Some companions were deliberately crafted, like a horse we named Jotah (the word for "j" in Spanish) and Pepe, the Mexican cockroach of our childhood cartoons. They gave us playful subjects with which to practice our Spanish vocabulary as we cycled the quiet roads of Spain several years ago. As his personality evolved, we discovered that Pepe had the habit of staying out late to go dancing, then would snooze on Jotah's back during the day. Jotah had an assortment of different colored straw and hay hats and often had odd things happening with his tail. Jotah and Pepe stayed behind in Spain when we left. We still smile when we think of them, as having a freehand with their lives made it easier to practice a broad range of new Spanish words than possible when sticking with reality. "Hat" wasn't pleased with these "air stairs." "Hat" on the other hand is a real object that has traveled with us for years. Hat is my too prim sun hat I wear because it provides great sun (and rain) coverage and survives daily crushing. But our companion Hat is always complaining that she'd rather be on a yacht and that our class of travel is beneath her. Hat is a troublemaker and shortly after we bring something new on board we are hearing reports of what Hat has told the new item about what to expect or what will happen to it. Hat and Baseball Cap are always feuding over who gets to come out of the pannier for sightseeing or lunch--except when it is raining. Then there is "Chuck," short for "Chuck Wagon". Chuck is the sometimes enormous plastic bag of food that resides on my back rack. Chuck moans on Saturday afternoon as he becomes bloated with the groceries that must tide us over until Monday lunch when in an area where the markets are closed on Sundays. He gets reassured on Sunday morning that he will be trimmer that night, and is complimented on Monday morning for his miraculous weight loss. Chuck can sometimes be heard saying things like "No Dad, no watermelon." And replacing Chuck's tattered outer plastic bag is "Chuck's getting new clothes"--Chuck prefers wearing yellow that matches my bike and hates wearing pink. And when my hiking boots have to ride on the end of the rack behind Chuck, he often threatens to kick them off to make more room for himself. In 2007 "Andy" came on board when we made some dietary additions based on the recommendations of the integrative medicine physician Andrew Weil. Fortunately, most were easy to do and none tasted like bad medicine. So now when his recommendations of Alaska wild salmon, walnuts, more strawberries, 70% cacao chocolate, or green tea show up on the menu, Bill can often be heard to say "Thanks, Andy." There is a old cycling acquaintance that happens to be a Reverend and references are often made to "The Rev" when we are having a pokey day. The Rev is a hard driving, powerful athlete that can run circles around us and happily does 2 or 3 times the daily mileage we do. When we get bogged down on a slow single-track or take too long at lunch, there might be reference to "The Rev wouldn't like this." And every night we go looking for "Bella." Belleruth Naparstek is the authoress of a sleep aid CD we listen to nightly at bedtime that Bill recorded on our iPod-like device. Bella whines if she isn't out at bedtime, complains if we call upon her too late in the evening, begs not to be forgotten at packing time in the morning, and scolds us about forgetting to recharge her batteries. Our bikes have long been known as "The Kids" and they are remarkably quiet during the day. We usually hear their comments in the morning as to what kind of night they had. Their experiences range from quivering all night when they shared space with an enormous St. Bernard this year in Germany to feeling smug at spending 3 days in the lovely inner courtyard breakfast room in Cordova, Spain when we were too cheap to eat breakfast there ourselves. Most of the items that travel with us remain treasured objects without voices or personalities but a few have become chatty road companions that liven up our days with their interjections. We are slightly embarrassed by them as it feels like a touch of madness yet probably isn't different from talking with one's dog or cat. And besides, with so many months of the year when we are a community of 2, it's nice to add another dimension to our social experience. We are in Zadar, Croatia. The parts and special tool for my rear hub arrived in Opatija, Croatia (near Rijeka) 4 days ago, on Saturday. After checking with 4 bike shops, Bill was allowed into the back room to use a vise and a chain whip and had my hub repaired 10 minutes before the shop closed for the weekend at 1 pm. After doing "hurry up and wait" for essentially 2 weeks, it was a scramble but we were on the road the next morning. So, another drama for the season is behind us. The weather has been less than kind the last month or so, but at least the rains haven't plunged the temperatures here as they have 'up north.' Today we sat out numerous thunderstorms but did so in the comfort of 70° temperatures. We plan to continue our journey south along the Croatian coast at least as far as Dubrovnik. From there we will likely take a ferry across the Adriatic to southern Italy with Sicily being the final destination for the 2007 touring season. We hope to leave the bikes in southern Italy before flying home from Frankfurt in early December.